A bold declaration, you might say, but I believe the prime reason for this assessment can be aimed solely at one factor; Vinny Burns. Though Burns returned to Dare in 2010, it was solely as a touring member, this is his first recorded work with the band since the aforementioned 'Blood...' album. With all due respect to previous guitarists Richie Dews and Andrew Moore, it's Burns' scintillating guitar performance that raises this Dare album way above their previous, more recent, output. Musically it's the atypical classy Dare we've come to expect, but it's the way Burns' sublime, mesmerizing guitar melodies weave through Wharton's lush, elegant soundscapes that elevate this album to a higher plain. It is very similarly paced throughout, but overall it maintains more sense of urgency, with a little more bite in the riffs and solos, while Wharton seems to be singing with a tad more conviction than of late. Indeed, once 'Home' kicks into gear, it's by far the liveliest opener to a Dare album since the mighty 'Wings Of Fire' in 1991, while 'Every Time We Say Goodbye' is, unusually, the album's only real ballad. 'Strength' is a darker-sounding number more in the vein of the 'Calm...' release, 'Until' casually dips its feet into the Celtic style that dominated the gorgeous 'Belief' and treading slightly new ground is 'On My Own', which could easily pass off as a bright-n-breezy Eagles-ish Country Rock song. 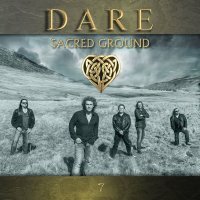 If you fell out of love with Dare when they took a different direction with the 'Calm...' album back in 1998, then 'Sacred Ground' is the album with which to rekindle that relationship. For long-term fans, it's a wonderful addition to an already superior back catalogue.